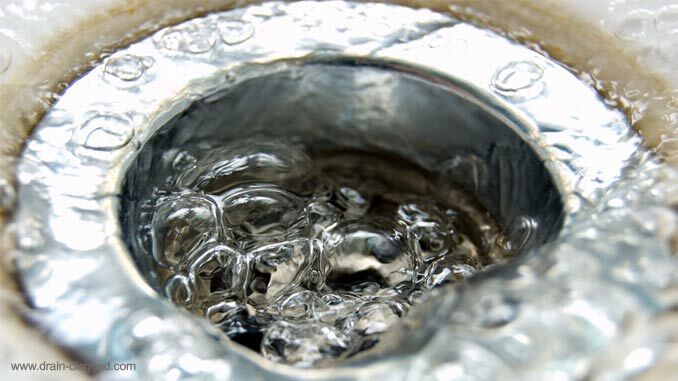 In this article we’ll show you what to do when dealing with a drain that won’t stop gurgling. A gurgling drain / sink is quite common so don’t be afraid. There are easy solutions available to stop that noise in your drain. Typically the noise might be the result of a clogged drain or vent pipe. There are a couple of early signs that indicate a clogged drain. When it smells unpleasantly, is blocked or makes sounds, for instance, such as gurgling. When you have a gurgling drain, this usually means that something is not perfect. In most cases the reason will be a partial blockage in the drain. In some cases, your sink drain will even make a gurgling sound when you use your shower or toilet – if the drains are somehow connected to each other. Water stalls at the point of congestion and this will make the water only drain slowly. If there is anything in the drain obstructing the water to flow normally this will create bubbles in the drain. This is where the gurgling sound comes from. A gurgling drain always indicates venting. Air that is trapped inside the pipes, rises and exits through the sink, making that familiar gurgling sound. Such issues usually occur due to sediments being stuck to the pipe walls or something stuck in the drain. By the way: This might also happen to toilets when the toilet is clogged. If this sound is happening in more than one drain in the house this might be causes by a severe blockage in the main drain. The pipe diameter will get smaller and smaller and soon causing a gurgling sound inside the drain. How can you prevent ending up with a gurgling drain that makes this annoying sound everytime you want to flush water down the drain / sink? This is how to prevent a gurgling drain! The most important way to stop the sound from the drain is to prevent a partial blockage of the drain. Please do not pour hair, dirt or food down the drain. This is the main reasons for partially blocked drains that start to gurgle with this familiar “blubb-blubb-blubb” sound. Ok, but if you already have a drain that gurgles: Our recommendation is to perform a drain cleaning. This can be done mechanically, for instance by clearing the drain from dirt using a plunger. In order to do that, fill the sink up with water to a height of 10 cm, and then use the plunger to clear the blockage by pumping. The dirt is broken up quickly this way and the blockage is cleared. With that, the gurgling sound in your drain will disappear as well. If you want to learn more about this then have a look at our section about the top 10 tips on how to clear clogged drains. Another method of cleaning the drain mechanically, is using a metal spiral or plumber’s snake, a drain cleaning device or a pipe cleaning hose. It is inserted into the gurgling drain down to the point of congestion, and then rotated until the blockage is cleared. When you’re dealing with a gurgling drain, you can also use chemical tube cleaners or drain cleaners. They dissolve the dirt so that it can be washed away easily. So as you can see: a gurgling drain is a manageable problem. If you are not able to get rid of the sound in your drain / sink on your own we highly recommend to consult a professional plumber. Plumbers usually do have all the tools needed to get rid of problems with your drain.